Gubernatorial Candidate Tony Evers Proposal: Spend 12.3% (10%?) more taxpayer funds on Wisconsin K-12 school districts; while killing substantive reading improvement efforts. Gubernatorial Candidate Tony Evers Proposal: Spend 12.3% more taxpayer funds on Wisconsin K-12 school districts; while killing substantive reading improvement efforts. Wisconsin’s average score (221) in 2013 is identical to 2011, and is statistically unchanged from our first NAEP score (224) in 1992.While we have remained stagnant, many other jurisdictions have seen statistically significant increases. Wisconsin ranked 31st out of 52 jurisdictions that participated in NAEP this year. In 1994, we ranked 3rd. Since 2007, the number of jurisdictions scoring significantly lower than Wisconsin has shrunk from 21 to 11. The number scoring significantly higher has grown from 8 to 15. Wisconsin sits in the lower half of the “middle” group of 26 jurisdictions. Only 8% of Wisconsin students scored at the advanced level, while 32% were below basic, the lowest level. Compared to their peer groups nationwide, Wisconsin’s white, black, Hispanic, Asian, low income, and disabled students all scored below their respective national averages. Wisconsin had the lowest scores for black students in the nation. Wisconsin had the largest gap between white and black students in the nation. Social and economic disadvantages affect achievement for many students, but other states do better at mitigating those realities. Wisconsin must look within the education system itself for improvement opportunities, starting with teacher preparation. Beginning in 2014, the Foundations of Reading exam will require prospective teachers to understand the science of reading that is woven through the Common Core State Standards and that is necessary for successful intervention with struggling readers. As DPI revises the regulations governing educator licensure and preparation program approval, it will be important to align them with the only comprehensive guidelines available, the Knowledge and Practice Standards for Teachers of Reading (Moats, Carreker, Davis, Meisel, Spear-Swerling, Wilson, 2010), and to encourage independent, objective program reviews for campuses. Equally important, our state and districts need to provide practicing teachers with that same knowledge of language structure and reading acquisition, and to track the impact of professional development on student performance outcomes. Programs like LETRS from Sopris Learning and the online coursework and coaching offerings from the Science of Reading Partnership deserve attention. Only then can we hope to see student outcomes begin to reflect the efforts of our dedicated educators. 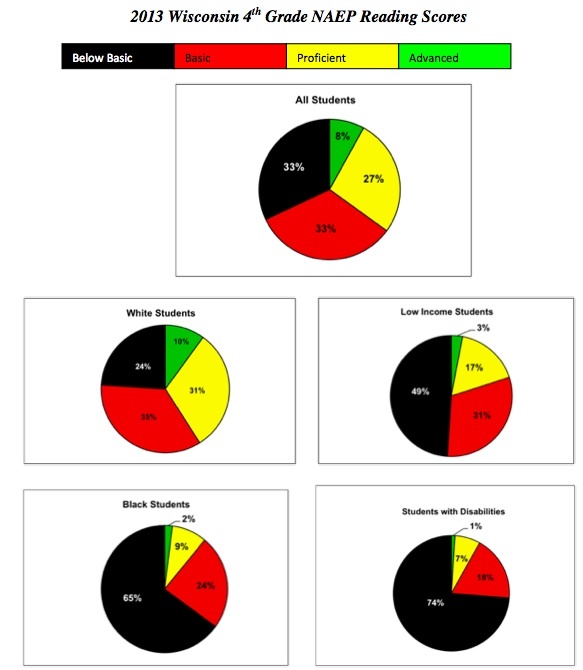 The pie charts below show the breakdown of proficiency levels of Wisconsin students as a whole and broken into sub-groups. The line graphs show the trend over time in Wisconsin scores compared to Massachusetts, Florida, and Washington, D.C., where the science of reading has found a greater acceptance in education, as well as the changes in national ranking for Massachusetts, Florida, and Wisconsin. Related: Madison’s disastrous reading results and Wisconsin adopts the MTEL-90 (Massachusetts) elementary teacher English content knowledge requirements. The Bill & Melinda Gates Foundation, the world’s largest philanthropy, and the foundation associated with Pearson, the giant textbook and school technology company, announced a partnership on Wednesday to create online reading and math courses aligned with the new academic standards that some 40 states have adopted in recent months. The 24 new courses will use video, interactive software, games, social media and other digital materials to present math lessons for kindergarten through 10th grade and English lessons for kindergarten through 12th grade, Pearson and Gates officials said. Widespread adoption of the new standards, known as the common core, has provoked a race among textbook publishers to revise their current classroom offerings so they align with the standards, and to produce new materials. The Gates-Pearson initiative appears to be the most ambitious such effort so far. 1. The state should require teacher candidates to pass a test of academic proficiency that assesses reading, writing and mathematics skills as a criterion for admission to teacher preparation programs. 2. All preparation programs in a state should use a common admissions test to facilitate program comparison, and the test should allow comparison of applicants to the general college-going population. The selection of applicants should be limited to the top half of that population. Wisconsin requires that approved undergraduate teacher preparation programs only accept teacher can- didates who have passed a basic skills test, the Praxis I. Although the state sets the minimum score for this test, it is normed just to the prospective teacher population. The state also allows teacher preparation programs to exempt candidates who demonstrate equivalent performance on a college entrance exam. Wisconsin also requires a 2.5 GPA for admission to an undergraduate program. To promote diversity, Wisconsin allows programs to admit up to 10 percent of the total number of students admitted who have not passed the basic skills test. Require all teacher candidates to pass a test of academic proficiency that assesses reading, writing and mathematics skills as a criterion for admission to teacher preparation programs. Even though the state’s policy that permits programs to admit up to 10 percent of students who have not passed the basic skills test is part of a laudable goal to promote diversity, allowing this exemption is risky because of the low bar set by the Praxis I (see next recommendation). Require preparation programs to use a common test normed to the general college-bound population. Wisconsin should require an assessment that demonstrates that candidates are academically com- petitive with all peers, regardless of their intended profession. Requiring a common test normed to the general college population would allow for the selection of applicants in the top half of their class, as well as facilitate program comparison. Consider requiring candidates to pass subject-matter tests as a condition of admission into teacher programs. In addition to ensuring that programs require a measure of academic performance for admission, Wisconsin might also want to consider requiring content testing prior to program admission as opposed to at the point of program completion. Program candidates are likely to have completed coursework that covers related test content in the prerequisite classes required for program admis- sion. Thus, it would be sensible to have candidates take content tests while this knowledge is fresh rather than wait two years to fulfill the requirement, and candidates lacking sufficient expertise would be able to remedy deficits prior to entering formal preparation. For admission to teacher preparation programs, Rhode Island and Delaware require a test of academic proficiency normed to the general college- bound population rather than a test that is normed just to prospective teachers. Delaware also requires teacher candidates to have a 3.0 GPA or be in the top 50th percentile for general education coursework completed. Rhode Island also requires an average cohort GPA of 3.0, and beginning in 2016, the cohort mean score on nationally-normed tests such as the ACT, SAT or GRE must be in the top 50th percentile. In 2020, the requirement for the mean test score will increase from the top half to the top third. After receiving a grade of D in 2009 and 2001, Wisconsin has risen to a D+ on the 2013 State Teacher Policy Yearbook released by the National Council on Teacher Quality. In the area of producing effective teachers of reading, Wisconsin received a bump up for requiring a rigorous test on the science of reading. The Foundations of Reading exam will be required beginning January 31, 2014. Ironically, Wisconsin also scored low for not requiring teacher preparation programs to prepare candidates in the science of reading instruction. We hope that will change through the revision of the content guidelines related to elementary licensure during a comprehensive review process that is underway at DPI this winter and spring. New legislation now requires as a condition of initial licensure that all elementary and special education teachers pass an examination identical to the Foundations of Reading test administered as part of the Massachusetts Tests for Educator Licensure. The passing score on the examination will be set at a level no lower than the level recommended by the developer of the test, based on the state’s standards. Each teacher preparation program must submit a list of program completers who have been recommended for licensure. Also, a system will be developed to publicly report measures of performance for each prep program. Beginning in the 2013-2014 school year, each program must display a passage rate on the first attempt of recent graduates on licensure exams. States were asked to review NCTQ’s identified updates and also to comment on policy changes related to teacher preparation that have occurred in the last year, pending changes or teacher preparation in the state more generally. States were also asked to review NCTQ’s analysis of teacher preparation authority (See Figure 20). Wisconsin noted that middle childhood–early adolescence elementary teachers are required to earn a subject area minor. Wisconsin also included links and citations pertaining to content test requirements for adding to secondary certifications. All teachers and administrators should receive more instruction in reading pedagogy that focuses on evidence-based practices and the five components of reading as defined by the National Reading Panel (phonemic awareness, phonics, fluency, vocabulary, and comprehension). There must be more accountability at the state level and a commitment by institutions of higher education to improving teacher preparation. Licensure requirements should be strengthened to include the Massachusetts Foundations of Reading exam by 2013. Teacher preparation programs should expand partnerships with local school districts and early childhood programs. Information on the performance of graduates of teacher preparation programs should be available to the public. A professional development conference should be convened for reading specialists and elementary school principals. DPI should make high quality, science-based, online professional development in reading available to all teachers. Professional development plans for all initial educators should include a component on instructional strategies for reading and writing. Professional development in reading instruction should be required for all teachers whose students continually show low levels of achievement and/or growth in reading. Wisconsin should use a universal statewide screening tool in pre-kindergarten through second grade to ensure that struggling readers are identified as early as possible. Proper accommodations should be given to English language learners and special education students. Formal assessments should not replace informal assessments, and schools should assess for formative and summative purposes. Educators should be given the knowledge to interpret assessments in a way that guides instruction. Student data should be shared among early childhood programs, K-12 schools, teachers, parents, reading specialists, and administrators. Wisconsin should explore the creation of a program similar to the Minnesota Reading Corps in 2013. DPI and the Department of Children and Families should work together to share data, allowing for evaluation of early childhood practices. All 4K programs should have an adequate literacy component. DPI will update the Wisconsin Model Early Learning Standards to ensure accuracy and alignment with the Common Core State Standards, and place more emphasis on fidelity of implementation of the WMELS. The YoungStar rating system for early childhood programs should include more specific early literacy criteria. The Educator Effectiveness Design Team should consider reading outcomes in its evaluation systems. The Wisconsin School Accountability Design Team should emphasize early reading proficiency as a key measure for schools and districts. Struggling schools and districts should be given ongoing quality professional development and required to implement scientific research-based screening, assessment, curriculum, and intervention. Educators and administrators should receive training on best practices in order to provide effective instruction for struggling readers. The state should enforce the federal definition for scientific research-based practices, encourage the use of What Works Clearinghouse, and facilitate communication about effective strategies. In addition to effective intervention throughout the school year, Wisconsin should consider mandatory evidence-based summer school programs for struggling readers, especially in the lower grades, and hold the programs accountable for results. Support should be given to programs such as Reach Out and Read that reach low-income families in settings that are well-attended by parents, provide books to low-income children, and encourage adults to read to children. The state should support programs that show families and caregivers how to foster oral language and reading skill development in children. Adult literacy agencies and K-12 schools should collaborate at the community level so that parents can improve their own literacy skills. Related: Erin Richards’ summary (and Google News aggregation) and many SIS links. Budget/Financing, Community Partners, Curriculum, Curriculum - Languages, Elections, Events, Governance/Board Decision Making, History - Madison Schools, School Climate, Staff Support, Student Support, Teacher Support, What Can I Do? The fourth meeting of the Governor’s Read to Lead task force took place in Milwaukee on Friday, July 29. The meeting was filmed by Wisconsin Eye, but we have not seen it offered yet through their website. We will send out a notice when that occurs. As always, we encourage you to watch and draw your own conclusions. Following is a synopsis of the meeting, which centered on reading improvement success in Florida and previously-discussed task force topics (teacher preparation, licensing, professional development, screening/intervention, early childhood). In addition, Superintendent Evers gave an update on activity within DPI. The discussion of the impact of societal factors on reading achievement was held over to the next meeting, as was further revisiting of early childhood issues. Opening: Governor Walker welcomed everyone and stressed the importance of this conversation on reading. Using WKCE data, which has been criticized nationally and locally for years as being derived from low standards, the Governor stated that 80% of Wisconsin students are proficient or advanced in reading, and he is seeking to serve the other 20%. The NAEP data, which figured prominently in the presentation of the guest speakers, tell a very different story. Superintendent Evers thanked the task force members and indicated that this is all about “connecting the dots” and putting all of the “puzzle pieces” together. The work of this task force will impact the work going on in other education-focused committees. The Florida Story: Guest speakers were Patricia Levesque, the Executive Director of the Foundation for Excellence in Education and the Foundation for Florida’s Future, and Mary Laura Bragg, the director of Florida’s statewide reading initiative, Just Read, Florida! from 2001 to 2006. In a series of slides, Levesque compared Wisconsin, Florida, and national performance on the NAEP reading test over the past decade. Despite challenges in terms of English language learners, a huge percentage of students on free/reduced lunch, and a minority-majority demographic, Florida has moved from the scraping the bottom on the NAEP to the top group of states. Over the same time period, Wisconsin has plummeted in national ranking, and our students now score below the national average in all subgroups for which NAEP data is disaggregated. 10 points on the NAEP scale is roughly equivalent to one grade level in performance, and Florida has moved from two grade levels below Wisconsin to 1/2 grade level above. For a full discussion of Wisconsin’s NAEP performance, see our website, http://www.wisconsinreadingcoalition.org. Levesque and Bragg also described the components of the reading initiative in Florida, which included grading all schools from A to F, an objective test-based promotion policy from third to fourth grade, required state-approved reading plans in each district, trained reading coaches in schools, research assistance from the Florida Center for Reading Research, required individual student intervention plans for struggling students, universal K-2 screening for reading problems, improved licensure testing for teachers and principals, the creation of a reading endorsement for teaching licenses, and on-line professional development available to all teachers. As noted above, achievement has gone up dramatically, the gap between demographic groups has narrowed, early intervention is much more common, and third grade retention percentages continue to fall. The middle school performance is now rising as those children who received early intervention in elementary school reach that level. Those students have not yet reached high school, and there is still work to be done there. To accomplish all this, Florida leveraged federal funds for Title 1 and 2 and IDEA, requiring that they be spent for state-approved reading purposes. The Governor also worked actively with business to create private/public partnerships supporting reading. Just Read, Florida! was able to engineer a statewide conference for principals that was funded from vendor fees. While Florida is a strong local control state, reading is controlled from the state level, eliminating the need for local curriculum directors to research and design reading plans without the resources or manpower to do so. Florida also cut off funding to university professors who refused to go along with science-based reading instruction and assessment. Florida is now sharing its story with other states, and offering assistance in reading plan development, as well as their screening program (FAIR assessment system) and their online professional development, which cost millions to develop. Levesque invited Wisconsin to join Indiana and other states at a conference in Florida this fall. Questions for, or challenges to, the presenters came from three task force members. Rachel Lander asked about the reading coaches, and Bragg responded that they were extensively trained by the state office, beginning with Reading First money. They are in the classroom modeling for teachers and also work with principals on understanding data and becoming building reading leaders. The coaches now have an association that has acquired a presence in the state. Linda Pils stated her belief that Wisconsin outperforms Florida at the middle school level, and that we have higher graduation rates than Florida. She cited opinions that third grade retention has some immediate effect, but the results are the same or better for non-retained students later, and that most retained students will not graduate from high school. She also pointed out Florida’s class size reduction requirement, and suggested that the NAEP gains came from that. Levesque explained that the retention studies to which Pils was referring were from other states, where retention decisions were made subjectively by teachers, and there was no requirement for science-based individual intervention plans. The gains for retained students in Florida are greater than for matched students who are not retained, and the gains persist over time. Further, retention did not adversely affect graduation rates. In fact, graduation rates have increased, and dropout rates have declined. The University of Arkansas is planning to do a study of Florida retention. The class size reduction policy did not take effect in Florida until last year, and a Harvard study concluded that it had no effect on student reading achievement. Task force member Steve Dykstra pointed out that you cannot compare the NAEP scores from two states without considering the difference in student demographics. Wisconsin’s middle school scores benefit from the fact that we have a relative abundance of white students who are not on free/reduced lunch. Our overall average student score in middle school may be higher than Florida, but when we compare similar cohorts from both states, Florida is far ahead. Tony Pedriana asked what kinds of incentives have been put in place for higher education, principals, etc. to move to a science-based system of instruction. The guests noted that when schools are graded, reading performance receives double weight in the formula. They also withheld funding for university programs that were not science-based. DPI Update: Superintendent Evers indicated that DPI is looking at action in fours areas: teacher licensure, the Wisconsin Model Early Learning Standards, the use of a screener to detect reading problems, and implementation of the Common Core State Standards. The committee looking at licensing is trying to decide whether they should recommend an existing, off-the-shelf competency exam, or revise the exam they are currently requiring (Praxis 2). He did not indicate who is on the committee or what existing tests they were looking at. In the past, several members of the task force have recommended that Wisconsin use the Foundations of Reading test given in Massachusetts and Connecticut. DPI is revising the WMELS to correct definitions and descriptions of phonological and phonemic awareness and phonics. The changes will align the WMELS with both the Report of the National Reading Panel and the Common Core State Standards. Per the suggestion of Eboni Howard, a guest speaker at the last meeting, they will get an outside opinion on the WMELS when they are finished. Evers did not indicate who is doing this work. DPI is looking at the possibility of using PALS screening or some other tool recommended by the National RTI Center to screen students in grades K-2 or K-3. Evers previously mentioned that this committee had been meeting for 6-7 months, but he did not indicate who is on it. Evers made reference to communication that was circulated this week (by Dr. Dan Gustafson and John Humphries) that expressed concern over the method in which DPI is implementing the Common Core. He stated that districts have been asking DPI for help in implementing the CC, and they want to provide districts with a number of resources. One of those is the model curriculum being developed by CESA 7. DPI is looking at it to see how it could help the state move forward, but no final decision has yet been made. Task force member Pam Heyde, substituting for Marcia Henry, suggested that it would be better to look at what Florida is doing rather than start from ground zero looking at guidelines. Patricia Levesque confirmed that Florida was willing to assist other states, and invited Wisconsin to join a meeting of state reading commissioners in October. Teacher Preparation: The discussion centered around what needs to change in teacher preparation programs, and how to fit this into a four-year degree. Steve Dykstra said that Texas has looked at this issue extensively. Most schools need three courses to cover reading adequately, but it is also important to look at the texts that are used in the courses. He referenced a study by Joshi that showed most of the college texts to be inadequate. Dawnene Hassett, UW-Madison literacy professor in charge of elementary teacher reading preparation, was invited to participate in this part of the discussion. She indicated we should talk in terms of content knowledge, not number of credits. In a couple of years, teachers will have to pass a Teacher Performance Assessment in order to graduate. This was described as a metacognitive exercise using student data. In 2012-13, UW-Madison will change its coursework, combining courses in some of the arts, and dropping some of the pedagogical, psychological offerings. Tony Pedriana said he felt schools of education had fallen down on teaching content derived from empirical studies. Pils was impressed with the assistance the FCRR gives to classroom teachers regarding interventions that work. She also said spending levels were important. Dykstra asked Mary Laura Bragg if she had worked with professors who thought they were in alignment with the research, but really weren’t. Bragg responded that “there’s research, and then there’s research.” They had to educate people on the difference between “research” from vendors and empirical research, which involves issues of fidelity and validation with different groups of students. Levesque stated that Florida increased reading requirements for elementary candidates from 3 to 6 credits, and added a 3 credit requirement for secondary candidates. Colleges were required to fit this in by eliminating non-content area pedagogy courses. Kathy Champeau repeated a concern from earlier meetings that teacher candidates need the opportunity to practice their new knowledge in a classroom setting, or they will forget it. Hassett hoped the Teacher Performance Assessment would help this. The TPA would probably require certain things to be included in the teacher candidate’s portfolio. Governor Walker said that the key to the effectiveness of Florida’s retention policy was the intervention provided to the students. He asked what they did to make sure intervention was successful. Levesque replied that one key was reading coaches in the classroom. Also, district reading plans, individual intervention plans, student academies, etc. all need to be approved by the state. There was consensus that there should be a difference in reading requirements for elementary vs. secondary teachers. There was no discussion of preparation for reading teachers, reading specialists, or special education teachers. Licensing: The discussion centered around what teacher standards need to be tested. Dykstra suggested that the Knowledge and Practice Standards for Teachers of Reading, written by Louisa Moats, et al, and published by the International Dyslexia Association in 2010, would be good teacher standards, and the basis for a teacher competency exam. There was no need for DPI to spend the next year discussing and inventing new teacher standards. Champeau said that the International Reading Association also has standards. Pedriana asked if those standards are based on research. Dykstra suggested that the task force look at the two sets of standards side-by-side and compare them. Professional Development: The facilitators looked for input on how professional development for practicing teachers should be targeted. Should the state target struggling teachers, schools, or districts for professional development? Rep. Jason Fields felt all three needed to be targeted. Heyde asked Levesque for more details on how Wisconsin could do professional development, when we often hear there is no money. Levesque provided more detail on the state making reading a priority, building public/private partnerships, and being more creative with federal grant money (e.g., the 20% of each grant that is normally carved out by the state for administration). There should be a clear reading plan (Florida started with just two people running their initiative, and after a decade only has eight people), and all the spending should align with the plan to be effective. You cannot keep sending money down the hole. Additional manpower was provided by the provision that all state employees would get one paid hour per week to volunteer on approved reading projects in schools, and also by community service requirements for high school students. Bragg suggested using the online Florida training modules, and perhaps combining them with modules from Louisiana. Dykstra also suggested taking advantage of existing training, including LETRS, which was made widely available in Massachusetts. He also stressed the importance of professional development for principals, coaches, and specialists. Bragg pointed out that many online training modules are free, or provided for a nominal charge that does not come close to what it would cost Wisconsin to develop its own professional development. Lander said there were many Wisconsin teachers who don’t need the training, and it should not be punitive. Champeau suggested that Florida spends way more money on education that Wisconsin, based on information provided by the NAEP. Levesque clarified that Florida actually is below the national average in cost per student. The only reason they spend more than Wisconsin is that they have more students. Rep. Steve Kestell stated that teachers around the entire state have a need for professional development, and it is dangerous to give it only to the districts that are performing the worst. Sarah Archibald (sitting in for Sen. Luther Olsen) said it would be good to look at the value added in districts across the state when trying to identify the greatest needs for professional development. The new statewide information system should provide us with some of this value added information, but not at a classroom teacher level. Evers commented that the state could require new teacher Professional Development Plans to include or be focused on reading. Pils commented that districts can have low and high performing schools, so it is not enough to look at district data. Champeau said that administrators also need this professional development. They cannot evaluate teachers if they do not have the knowledge themselves. Dykstra mentioned a Florida guidebook for principals with a checklist to help them. He is concerned about teachers who develop PDP’s with no guidance, and spend a lot of time and money on poor training and learning. There is a need for a clearinghouse for professional development programs. Screening/Intervention: One of the main questions here was whether the screening should be universal using the same tools across the state. Champeau repeated a belief that there are districts who are doing well with the screening they are doing, and they should not be required to change or add something new. Dykstra responded that we need comparable data from every school to use value added analysis, so a universal tool makes sense. He also said there was going to be a lot of opposition to this, given the statements against screening that were issued when Rep. Keith Ripp introduced legislation on this topic in the last biennium. He felt the task force has not seen any screener in enough detail to recommend a particular one at this time. Heyde said we need a screener that screens for the right things. Pils agreed with Dykstra and Heyde. She mentioned that DIBELS is free and doesn’t take much time. Michele Erickson asked if a task force recommendation would turn into a mandate. She asked if Florida used a universal screener. Levesque replied that Florida initially used DIBELS statewide, and then the FCRR developed the FAIR assessments for them. The legislature in Florida mandated the policy of universal kindergarten screening that also traces students back to their pre-K programs to see which ones are doing a better job. Wisconsin could purchase the FAIR assessments from Florida. Archilbald suggested phasing in screening if we could not afford to do it all at once. Evers supports local control, but said there are reasons to have a universal screener for data systems, to inform college programs, and to implement professional development. Lander asked what screening information we could get from the WKCE. Evers responded that the WKCE doesn’t start unitl third grade. Dykstra said we need a rubric about screening, and who needs what type and how often. Pedriana said student mobility is another reason for a universal screener. There was consensus that early screening is important. Certainly by 4K or 5K, but even at age three if a system could be established. Possibilities mentioned were district-run screenings or pediatrician screenings. Walker reminded the task force that it only makes sense to screen if you have the ability to intervene with something. Mara Brown wasn’t sure that a universal screener would tell her anything more about her students than she already knows. Levesque said she could provide a screening roadmap rubric for the task force. No one on the task force had suggestions for specific interventions. The feeling was that it is more important to have a well-trained teacher. Both Florida and Oregon started evaluating and rating interventions, but stopped because they got bogged down. Wisconsin must also be careful about evaluations by What Works Clearinghouse, which has some problems. Pedriana asked if the task force is prepared to endorse a model of instruction based on science, where failure is not an option. The facilitator said this discussion would have to wait for later. Early Childhood: The task force agreed that YoungStar should include more specific literacy targets. Rep. Kestell felt that some district are opening 4K programs primarily for added revenue, and that there is wide variability in quality. There is a need to spend more time on this and decide what 4K should look like. Evers said we should use the Common Core and work backward to determine what needs to be done in 4K. Wrap-Up: Further discussion of early childhood will be put over to the next meeting, as will the societal issues and accountability. A meeting site has not yet been set, but Governor Walker indicted he liked moving around the state. The Governor’s aides will follow up as to locations and specific agenda. The next meeting will be Thursday, August 25. All meetings are open to the public. Related: An Open Letter to the Wisconsin Read To Lead Task Force on Implementing Common Core Academic Standards; DPI: “Leading Us Backwards” and how does Wisconsin Compare? www.wisconsin2.org. 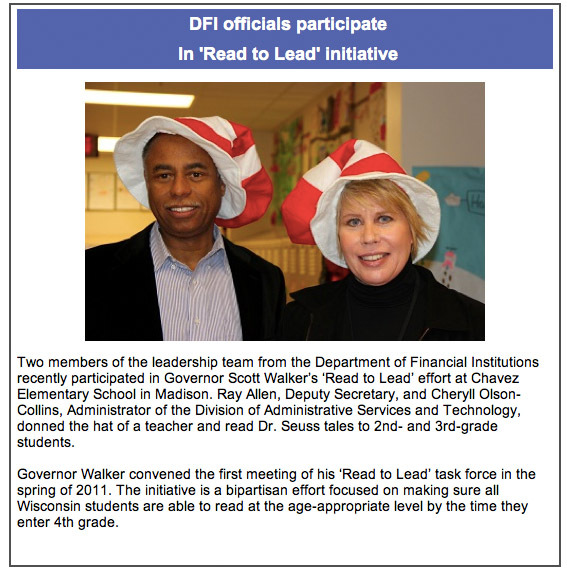 Much more on Wisconsin’s Read to Lead Task Force, here. (2009) What impact do high school mathematics curricula have on college-level mathematics placement? Could you pass a teacher licensing test? How Effective are Tennessee’s Teacher Preparation Programs? A group of national and local education experts will support Superintendent Jennifer Cheatham’s entry plan work, the district announced today. The Superintendent’s Teaching and Learning Transition Team will begin work this week. The eight member team brings together education experts from Harvard University and the University of Wisconsin-Madison, as well as educational practitioners from other urban school districts. The team, which was selected by the superintendent and will be funded through community and private foundations, will be chaired by Dr. Robert Peterkin, Professor Emeritus of the Harvard Graduate School of Education and includes: Maree Sneed, partner at Hogan and Lovells US LLC; John Diamond, sociologist of education at the Harvard Graduate School of Education; Sheila Brown, Co-Director at the Aspen Institute’s Education and Society Program; Allan Odden, Professor of Educational Leadership and Policy Analysis at the University of Wisconsin-Madison; John Peterburs, Executive Director of Quarles & Brady; Wilma Valero, Coordinator for English Language Learner Programs in Elgin, Il; and Gloria Ladson-Billings, Professor of Urban Education at the University of Wisconsin-Madison. As Superintendent Cheatham continues the listening and learning phase of her entry plan, the Teaching and Learning Transition Team will also meet with central office leaders, conduct focus groups with teachers, principals, and parents as needed, and review a variety of relevant data. At the end of their work, the team will present the superintendent with a report of what they have learned and recommendations for moving forward systemically with best practices. That report will be used, along with data collected by the superintendent in school visits and other entry plan activities, to refine the district’s goals and strategic priorities. Five Strategic Priority Action Teams, centered around the most critical challenges facing the Madison Metropolitan School District, are among the outcomes of the recently-completed strategic plan. The five Strategic Priority Action Teams, one for each of the five priorities, are taking on the responsibility for continuous improvement toward “their” priority. The Action Teams, which will have both staff members and non-staff members, will be responsible for existing initiatives. In addition they will identify and recommend benchmarks to use in assessing school district performance. a set of beliefs about children, families, enhanced learning, and the quality of life and learning, all of which are integrated with an identified District vision and mission. improved cost efficiency and effectiveness of many central office functions, which are being addressed on an ongoing basis. Madison Schools’ initial strategic plan came about in 1991, and provided direction until this update. You can see the complete strategic plan on the district’s Web site: http://www.mmsd.org. Amid the picket signs Madison teachers carried at a rally last month protesting slow-moving contract talks, some teachers also carried a bright purple flier. While hardly erudite — some would call it juvenile — the flier expressed the sentiment many teachers have toward two of Superintendent Cheryl Wilhoyte’s biggest initiatives: the effort to create districtwide academic standards, and the teacher-training program that goes along with it. Neither issue is a subject of bargaining. But the programs have become a sort of catch-all target for teachers who blame Wilhoyte for everything from the poor state of labor-management relations to the current contract impasse. The 2009 update to Madison’s “Strategic Planning Process“. The Madison school district’s recent “achievement gap and accountability plan“. Wilhoyte, on the other hand, has demonstrated that she is a tough, hands-on administrator in her role as assistant superintendent for instruction and school administration in Anne Arundel County, Maryland. And even those who have tangled with her praise her philosophy, which is to put kids first. She has been a leader in Maryland in shaking up the educational status quo, of moving it forward to meeat the needs of the children, even while juggling new programs with budget cuts. The big question remaining about her: She has never been a superintendent. How would she handle the top job? Retiring Ripon Superintendent Richard Zimman’s 2009 speech to the Madison Rotary club. Matthew DeFour summarizes and collects some feedback on the District’s press release here. It would be useful to dig into the archives and review the various strategic plans and initiatives over the years and compare the words and spending with results. This probably sounds familiar: You are with a group of friends arguing about some piece of trivia or historical fact. Someone says, “Wait, let me look this up on Wikipedia,” and proceeds to read the information out loud to the whole group, thus resolving the argument. Don’t dismiss this as a trivial occasion. It represents a learning moment, or more precisely, a microlearning moment, and it foreshadows a much larger transformation–to what I call socialstructed learning. Socialstructed learning is an aggregation of microlearning experiences drawn from a rich ecology of content and driven not by grades but by social and intrinsic rewards. The microlearning moment may last a few minutes, hours, or days (if you are absorbed in reading something, tinkering with something, or listening to something from which you just can’t walk away). Socialstructed learning may be the future, but the foundations of this kind of education lie far in the past. Leading philosophers of education–from Socrates to Plutarch, Rousseau to Dewey–talked about many of these ideals centuries ago. Today, we have a host of tools to make their vision reality. I may be one of a tiny minority who think that schools are for student academic work. Of course, sports, concerts, social programs, dances, and all sorts of other youth activities are important, but students don’t need schools to do them in. My view is that without student academic work, all the buildings, bond issues, budgets, school boards, teacher unions, superintendent and teacher training programs, Broad/Gates/WalMart grants, local-state-federal education departments, NCLB, RTT, CC, CCSSO, Schools of Education, standards projects, legislation, regulations, and all the rest of the Adults Only paraphernalia surrounding education in this country these days are just a waste of money and time. The Education Punditocracy, including blogs, magazines, newspapers, foundations, Finn/Hess/Petrilli, etc., and even my friend and inspiration, Diane Ravitch, among hundreds and hundreds of others, are completely preoccupied with and absorbed in their consideration of what Adults are doing in education. The actual academic work of students takes place at much too low a level to attract their notice. They seem to be making the assumption that if they can just fix all the Adults Only stuff, then somehow student academic work will take care of itself. But they don’t pay any attention in the meantime to whether students are actually doing any academic work or not. And they have not learned that the students, and the students alone, have the power to determine whether they will do any academic work, and also what its quality will be. To reiterate: without student academic work, all the rest of the bustle, noise, commentary, and the hundreds of billions of dollars spent will amount to nothing, so it should be important to pay attention to student academic work, should it not? I came to understand this because for the last 25 years in particular, and for about 10 years before that, I have been fully engaged in efforts that completely depend upon good student academic work, and I have been fascinated to discover how few Education people seem to be involved with that, and that just about every one of them, though laboring away quite seriously and conscientiously, seems to spend all their time on the Adults Only matters, and to have almost no interest, other than to give it lip service and quickly move on, in the serious academic work of students. If that should somehow change, and if student academic work were to become the central focus of what we pay attention to in education, there is a chance we might see more of it, and that its quality might improve too. But if we continue to ignore it and focus on Adults Only, that most assuredly is not going to happen. As the Hindus say: “Whatever you give your Attention to grows in your life,” and we have been giving, IMHO, far too much attention (almost all of it) to the Adults Only aspects of education and far too little to student academic work. To test what I am saying, if a kind Reader would go back over articles, books, blogs, and speeches on education in recent years, please do let me know if you find any that talk about student science projects, the complete nonfiction books they are reading, or the serious history research papers they are writing. I believe if you look closely, almost all that you find will show people caught up in what Adults Only are doing, should do, will do, must do, or might do, and there will be little to no attention to the actual academic work of students in our schools. But please prove me mistaken, with evidence, if you would be so kind. The education bill with provisions related to Educator Effectiveness and Early Literacy is now waiting the governor’s signature. State Superintendent Tony Evers applauded aspects of the bill this week, while acknowledging “difficult” moments during the Legislature’s just-ended session. One provision of the education bill “incorporates the on-going work of my Educator Effectiveness Design Team,” Evers said. “I look forward to the Governor signing this important bill into law,” Evers concluded. Much more on the Read to Lead initiative, here. 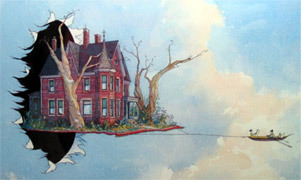 This photo recently appeared on the Wisconsin Department of Financial Institutions’ website. The current Wisconsin teacher licensure exam has few questions on reading instruction, and many of those questions are lacking in rigor. Reading should be emphasized specifically; however, the state should also take this opportunity to strengthen licensure requirements overall. Specifically, the Task Force recommends the well-­‐regarded Massachusetts Test for Education Licensure (MTEL) “Foundations of Reading” to be the required state exam by 2013 to raise the bar. The exam should be incorporated within the current Wisconsin exam to reduce costs in the short term. In the long term, the state should explore adopting MTEL exams across all subject areas. As part of the process of adopting a new exam, the Wisconsin Department of Public Instruction (DPI) will inform institutions of higher education on what will be covered on the MTEL, thereby igniting a much-­‐needed conversation to ensure the theoretical and technical knowledge needed to teach students to read is effectively and sufficiently taught to prospective reading teachers. After Detroit, Milwaukee is the country’s most segregated city. The Milwaukee Public School District (MPS) has an endemic racial achievement gap, in which, in terms of aggregate statistics, African American students perform three to four years below their European American counterparts in both math and reading. Combine this with a general dearth of resources — as is common to virtually all of public education — and you have a recipe for inadequate schooling that is failing its almost 90,000 students. The crisis in Milwaukee is indicative of the educational crisis roiling the nation. Across the United States, school districts are facing enormous budget deficits, decreasing enrollment and intense pedagogical and ideological debates questioning the very foundations of modern education. The debate is particularly vociferous here in Wisconsin, where the Wisconsin Education Association Council feels threatened by Governor Scott Walker’s educational platform. This past Tuesday, however, WEAC introduced a series of reforms it would endorse, many of which took observers by surprise, and received mixed reactions. The reform drawing the most ire is the proposal to carve up MPS into multiple smaller districts to make them more manageable, and thus more successful. However, as pointed out by one observer, this separation of districts would probably mirror racial divisions within the city, compounding instead of alleviating racial achievement gaps. Protecting School Reform in D.C. It was inevitable that Michelle Rhee, the District of Columbia’s hard-driving schools chancellor, would resign after her boss, Mayor Adrian Fenty, lost last month’s Democratic primary. It was no secret that Ms. Rhee had a strained relationship with Vincent Gray, the presumptive mayor and chairman of the City Council. Still, Ms. Rhee’s departure is a loss for the nation’s capital. It has unsettled middle-class parents who valued the strong, reform-minded leadership that was setting Washington’s schools on the path back from failure. And it sent a tremor through the private foundations that provisionally committed nearly $80 million to support the school reforms that were started during Ms. Rhee’s tenure. After Mr. Gray’s clashes with Ms. Rhee, it was good news that he said the right things after her resignation. He pledged to move ahead with the reform agenda, which has strengthened the city’s teacher corps, remade a patronage-ridden central bureaucracy and raised math and reading scores. He said he would keep Ms. Rhee’s senior staff on for the remainder of the school year and named her deputy and longtime associate, Kaya Henderson, the interim chancellor. E.D. Hirsch has called this “technique” philosophy of literacy instruction, “How-To-Ism” and says that it quite uselessly tries to substitute methods and skills for the knowledge that students must have in order to read well and often, and to write on academic subjects in school. Literacy Kudzu has been with us for a long time, but it has received new fertilizer from large private foundation and now federal standards grants which will only help it choke, where it can, attention to the reading of complete books and the writing of serious academic papers by the students in our schools. Educrat Professors and Educrat Psychologists who have, perhaps, missed learning much about history and literature during their own educations, and have not made any obvious attempt to study their value in their education research, of course fall back on what they feel they can do: teach processes, skills, methods, rubrics, parameters, and techniques of literacy instruction. Their efforts, wherever they are successful, will be a disaster, in my view, for teachers and students who care about academic writing and about history and literature in the schools. This is the sort of advice, completely foreign to the literacy kudzu community, which understands that in writing one first must have something to say (knowledge) and then one must work to express that knowledge so it may be understood. That may not play to the literacy kudzu community’s perception of their strengths, but it has a lot more to do with academic reading and writing than anything they are working to inflict on our teachers and students. I hope they, including the foundations and the university consultant world, may before too long pause to re-consider their approach to literacy instruction, before we experience the damage from this pest-weed which they are presently, perhaps unwittingly, in the method-technique-process of spreading in our schools. In the 1980s, when I was teaching history at the high school in Concord, Massachusetts, one day there was a faculty meeting during which some of my colleagues put on a skit about one of our most intractable problems: students wandering in the hallways during classes. One person played the principal, another the hall monitor, and others the guidance counselor, the vice-principal, and I can’t remember who else from the staff. One teacher played the student who had been in the halls. They did a good job on the acting and the lines were good, but as it went on, I noticed something a bit odd. Everyone had a part and things to say, but the only passive member of the show was the student, who had nothing much to say or do. I notice a parallel to this in the majority of discussions about education reform these days. With some exceptions, including Carol Jago, Diane Ravitch, Paul Zoch, and me, edupundits seem occupied with just about everything except what students do academically. There is a lot of discussion of what teachers do, and what superintendents, curriculum coordinators, principals, financial officers, mayors, legislators, and so on, do, but the actual academic work of students gets very little attention. This observation was reinforced for me when the TCR Institute did a study in 2002 of the assignment of serious term papers in U.S. public high schools. It was the first (and last) study of its kind, and it found that the majority of HS students are not being asked to do the sort of academic writing they need to work on to prepare themselves for college (and career). My perspective on this is necessarily a bottom-up, Lower Education one. I publish the serious research papers of high school students of history. Most of the 20,000+ U.S. public high schools never send me one, which is not a great surprise, because most history departments, other than in IB schools, do not assign research papers. But it gives me a curiosity over the neglect of student work which does not seem to be present in those whose focus is at a Higher Level in education. Those who live on the Public Policy level of Education Punditry can not see far enough Down or focus closely enough on the activity of schools to find out whether our HS students are reading history books and writing term papers. I believe this is because foundation people, consultants, education professors, public policy experts, and their tribes mostly talk to each other, not to students or even to teachers, who are so far far beneath them. They hold conferences, and symposia, and they write papers and books about what needs to be done in education, but from almost none of them come suggestions that involve the academic reading and writing our students should be doing. Of course what teachers do is vastly important, as well as very difficult to influence, but surely it cannot be that much more important than what students do. Naturally, we should design curricula rich in knowledge, but if they don’t include serious independent academic work by students, the burden will still be on the teacher, and many too many students can slide through under it and arrive in college ready for their remedial classes in reading, math and writing, as more than a million do now each year. Tony Wagner, the only person I know at the Harvard Education School who is interested in student work, did a focus group with some graduates of a high school he was working with, and they all said they wished they had been given more serious work in academic writing while they were in the high school. I asked him how many schools he knows of which take the time to hold focus groups with their recent graduates to get feedback from them on their level of academic preparation in school, and he said he only knew of three high schools in the country which did it. We do need improvements in all the things the edupundits are working on, and the foundations and our governments are spending billions on. But if we continue to lack curiosity about and to ignore what students are doing academically, I feel sure all that money will continue to be wasted, as it has been so many many times in the past. The video of this presentation is about 1 1/2 hours long. Click on the image at left to watch the video. The video will play immediately, while the file continues to download. MP3 Audio is available here. We are pleased to have William Fitzhugh, Editor of The Concord Review, present this lecture on history research and publication of original papers by high school students. “A group of professors, teachers, business people, lawyers and community people invited me to speak at the University of Wisconsin in Madison about the work of The Concord Review since 1987, and about the problems of college readiness and academic writing for high school students. In Madison I also had a chance to speak about the huge imbalance in our attention to scholars and athletes at the high school level. I had recently seen a nationally televised high school football game in which, at breaks in the action, an athlete would come to the sidelines, and announce, to the national audience, which college he had decided to “sign” with. This is a far cry from what happens for high school scholars. High school coaches get a lot of attention for their best athletes, but if the coach also happens to be a history teacher, he or she will hear nothing from a college in the way of interest in his or her most outstanding history student. College Preparation, Curriculum, Curriculum - Languages, Events, What Can I Do? Will Fitzhugh in Madison 11/19 @ 7:00p.m. The Boston Globe reported recently that Michelle Wie, the 16-year-old Korean-American golfing phenomenon, not only speaks Korean and English, but has also taken four years of Japanese, and is beginning to study Mandarin. She is planning to apply early to Stanford University. I would be willing to bet, however, that in high school her academic writing has been limited to the five-paragraph essay, and it is very likely that she has not been assigned a complete nonfiction book. For the last two years, and especially since the National Endowment for the Arts unveiled the findings of its large ($300,000) study of reading of fiction in the United States, I have been seeking funding for a much smaller study of the assignment of complete nonfiction books in U.S. public high schools. This proposed study, which education historian Diane Ravitch has called “timely and relevant,” has met with little interest, having so far been turned down by the National Endowment for the Humanities as well as a number of foundations and institutes both large and small. Still, I have a fair amount of anecdotal evidence some of it from people who would be quite shocked to hear that high school English departments were no longer assigning any complete novels that the non-assignment of nonfiction books on subjects like history is unremarkable and, in fact, accepted. WF: NAGB is the National Assessment Governing Board, which runs the NAEP, “America’s Report Card,” as they say. I was glad that Diane Ravitch recommended me for the Steering Committee for the new national writing assessment scheduled for 2011. I was very impressed with the intelligence and competence of Mary Crovo, representing NAEP, and Rosanne Cook, who is running the project for American College Testing. Many people on the Committee were from the National Council of Teachers of English and the College Composition world, which have little interest in having students read history books or write history research papers. In fact that world favors, or has favored in the past, personal and creative writing and the five-paragraph essay, which do a terrible job of preparing high school students for the nonfiction books and the academic term papers most will be asked to cope with in college. 2) Given the paucity of writing that goes on in the high schools of America, is it really fair to ask high school students to engage in a robust writing assessment? WF: It would not be fair to ask high school students to play in a football game if they hadn’t had an opportunity for lots of practice, and it is very hard to ask high school students to do the sort of academic expository writing they should be doing if they have never done it in all their years in school. But we need to start somewhere. Every high school student does not need to be able to play football, but they all need to be able to read nonfiction books and write serious term papers. 3) On the other hand, since so much of the college experience is writing, are high school teachers doing students a disservice by NOT requiring more writing? Mayor Tom Barrett and the Milwaukee School Board agree on this much: The community needs an accurate reading on the district’s finances. Unfortunately, that may be the only thing they agree on. Both are moving separately on plans to get the numbers. The School Board wants to spend $50,000 of taxpayers’ money to perform an audit to see where the Milwaukee Public Schools can be more efficient. Barrett is seeking funding from local foundations for an assessment of the struggling district’s financial and operational situation — a study that also could take the next step and recommend restructuring and how to best direct resources to the classroom where they can most help educate Milwaukee’s kids. On paper, we believe Barrett’s plan goes beyond that of the School Board, because it will home in on a half-dozen or so top priorities that, when funded adequately, will improve MPS performance and increase the district’s credibility among parents, taxpayers and decision-makers in Madison. For Barrett’s plan to have bite, he needs the support of foundations to retain a firm expert in urban school system finance and operations. Then the mayor needs to pressure the board and administration to get to work. One district is finding that simple measures are helping kids read. If administrators in the Centennial School District are right, all it takes is a few minutes a day to get many of their struggling readers on track. The district’s five elementary schools are finishing the first year of the Centennial Early Reading Foundations program (CERF), a K-3 literacy initiative created to reduce the number of special education referrals, to lift more students to grade level, and to improve children’s social development, through increased small-group instruction and assessment, tailored to each child’s needs. Much of the extra work occurs right in the classroom.